Welcome To My 119th Trip Report! Instead of doing Korean Air both ways, I decided to do a return on another carrier. Few came in mind: Jeju Air, Eastar Jet and T'Way. Since I have done Eastar Jet on both domestic and international routes, it was a toss between this and T'Way. Jeju Air was offering a very low price at that time so I went for it, it was around 30,000 Won cheaper than T'way. The airline has updated its website since the last time I used it. It's more user-friendly and I didn't have to use Internet Explorer to do the booking. However, make sure you key in the details carefully, if not it will restart from the beginning and that's frustrating! You can check out my previous trip report with this airline over here. This airline has a mobile app (IOS), for more information, please click here. As you can see the grey colour means the seats are taken, while the orange stripes represents the emergency row which cost more, about 5,000 KRW more if I am not wrong. This airfare also includes 15kg luggage allowance. After clicking the purchase button, within seconds I received the confirmation email. A better experience compared to my previous. After arriving from my previous flight on Korean Air, I headed out of the airport for a while, around 2 hours later I was back to just relax and enjoy some dessert at the Droptop Restaurant located at the floor above the Departure Hall. I had the Honey nuts with cream on the bread (Korean's dessert) and a Strawberry Mango Smoothie. Good bye, HL7750. Thank you for the ride! The aircraft headed back to Gimpo. Looking at some familiar registration numbers, HL8213 caught my eye! 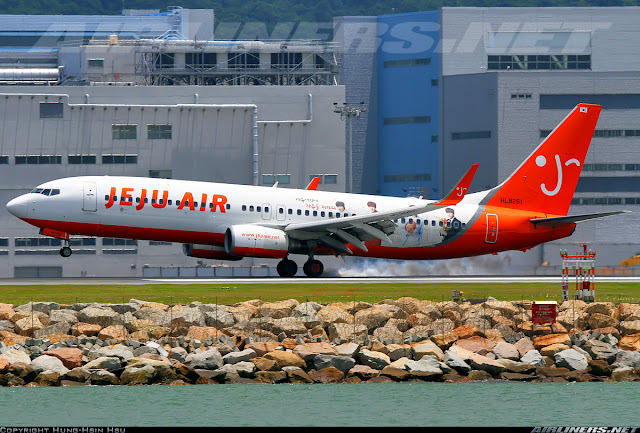 This aircraft flew me from Gimpo to Busan, it's Air Busan's Airbus A321. After finishing my work, I had a couple of hours left. I decided to collect my boarding pass at the check-in counter. No queue and I got my boarding pass within minutes, thanks to the friendly staff. At Jeju Airport, there is a line for foreigners at the passport check counter, this is to check whether you overstay or not. Once I got the boarding pass, I made my way to the airside. As it wasn't crowded, I was there after the security check after 5 minutes. Headed to this restaurant for my dinner, my 2nd time here. I had the beef stew for dinner and it was absolutely delicious. I finished it completely including the side-dishes. Food over in Korea may be expensive but they are certainly value of money. While doing a check on Flightradar24, I couldn't spot my aircraft as I suspected it didn't have the ADS-B (Automatic Dependent Surveillance- Broadcast) system on the aircraft which Flightradar24 has a receiver to receive the signal, but it didn't receive any from the aircraft. For more info, please check it out over here. In the end, I gave up and decided to check the registration from the landing gear or at the aircraft entrance where there is a display that state the aircraft's information. After eating, I walked around the airside, there was seating area but it was packed everywhere especially near the duty free shops so I could only wait around until a seat is vacant. WiFi wasn't very strong and I could only get it near certain gates. Boarding for T'Way and half an hour later it was my flight. The aircraft came not too long after this T'way aircraft pushed back and take off. While walking down the aero-bridge, I kept looking at the landing gear for the numbers and finally when I was near the door, I saw 3 numbers '261' and I knew at once I was on HL8261 and while I was at the entrance of the door waiting for the passengers to move in, I saw the original registration of this aircraft, VH-VOD and I goggled it which indeed showed HL8261, this aircraft used to operate for Virgin Blue and was in Virgin Australia colours for a short period before transferring over to this airline. The orange cover represents the seats with better legroom space and this require extra payment. If the seat is vacant, you can move there provided you pay for it on the spot. For a short flight like this, I didn't think its necessary to move there. The leg-room space of Jeju's Boeing 737-800. Just like other Low Cost Carriers, the legroom space is tight. The audio channel which is not used by Jeju Air. Disembarking time, I was one of the last to leave. I had another enjoyable flight. This time, our plane parked at the remote parking lot. The next duty would be around 6 in the morning the following day. A well deserved rest for HL8261. A choice of drink was served, I had the orange juice. Are you hungry? The airline sells food only on its international routes. T'Way and Eastarjet's 737 were departing to Gimpo as well. Taxiing to the runway for departure. The aircraft took off in calm weather. Landed and taxiing out of the runway towards our remote parking lot. The flight was pretty smooth through out and the cabin crew were great. These Koreans are well trained to provide service for the passengers. The Captain made his speech during the flight and his English is good. There was an incident after landing, this passenger beside mine was complaining about something. I had no idea what he was ranting since the language was in Korean. I think it was because of me and the more it went on, the more pissed I was. Somehow his wife saw my reaction and told him to shut it. If he wanted to take photos, next time choose the window seat! After the flight, I waited for everyone to alight, preferring to avoid both of them. Videos of the take-off and landing! South Korean carriers are reliable. You are spoilt for choices especially on its domestic sectors like GMP-CJU-GMP, with so many flights and airlines to choose from. 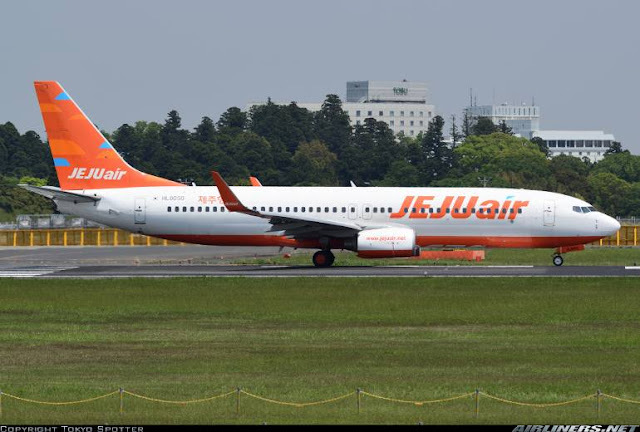 Jeju Air is definitely in my recommended list, its a reliable airline that meets the basic requirement such as good in-flight service, punctuality, good safety record and clean aircraft. So book with this airline with confidence. You shouldn't have any problems with the website. For the cabin, don't expect much since this is a low cost carrier and the interior is pretty much similar with other Low Cost Carriers; tight seat pitch, no IFE (In-Flight Entertainment system and apart from the luggage allowance, everything else is payable. Do watch out for the discounted airfares from this airline and the others, it can be very cheap! That's the good thing about competition. 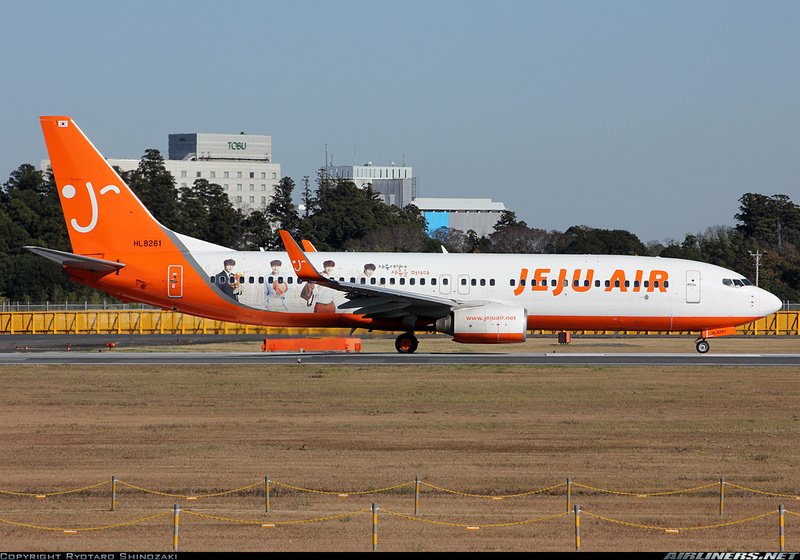 Thank you for reading this trip report, you can check out my other Jeju Air's trip report over here.